Kyle Hartzell of BowlerX is our tester for the Track 300T. The testing was performed on a fresh medium house tapered shot. Kyle launches the ball close to 18mph and the ball enters the pocket at 16.72 mph. He’s targeting 12 out to 6 or 7 at the breakpoint of about 40 ft. Despite the dull box finish and it appearing to start up a little earlier, it still generates impressive entry angle at 5.74 degrees. This ball prefers more direct lines and is quite impressive at the pocket when using more direct lines. Honestly, seeing the numbers on this ball was a revelation. I was pleasantly surprised to see that kind of entry angle, despite the appearance of early and smooth hook. When comparing it to the 607A SE out of box, you can see the clear difference in the tracks and shape of the shot. 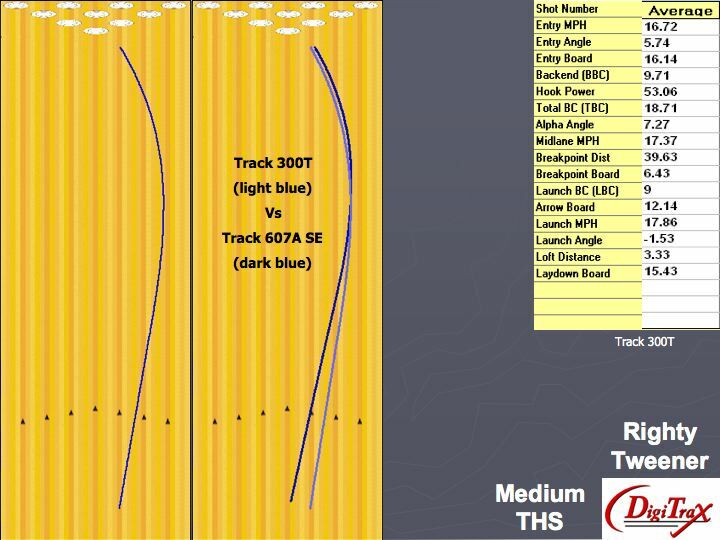 The 607A is stronger overall, longer and more angular than the 300T. The 300T is also pretty forgiving with misses to inside due to how smooth it is. The dull finish makes it less over/under at the end of the pattern. It will be very usable on fresh shots as well as transition. This ball will likely impress many with it’s smooth traction shape. It can be used for medium and lighter shots. It has that Traction shape that you normally see from more direct lines with aggressive balls on high volumes so you will see that similar shape but on lower volumes. Pretty impressive. Don’t forget to check out the full review and video of the Track 300T.